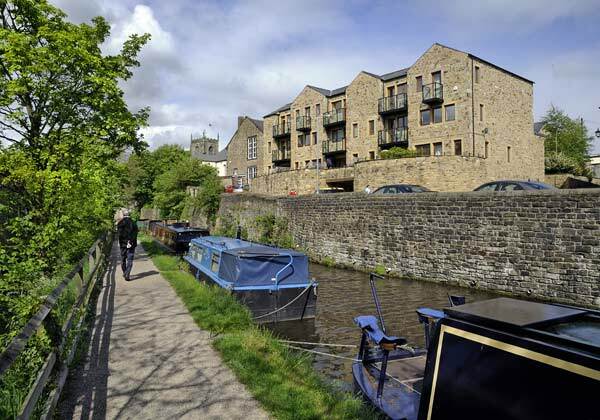 Skipton lies just outside the Yorkshire Dales National Park and is known as "The Gateway to the Dales". The town was settled long before the Normans conquered England, and its name is derived from "sheep town", as many sheep farmers once lived here. 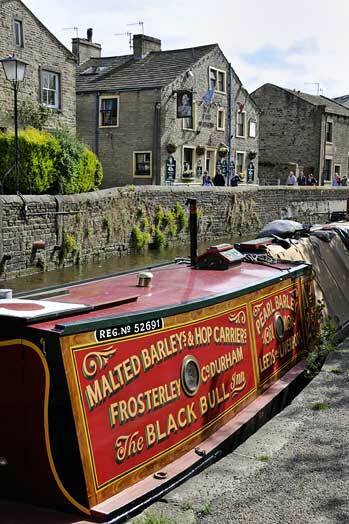 After the Leeds-Liverpool canal arrived in 1770, the town went on to prosper as an important wool town. After the railways arrived in the 1840s the town became even more prosperous with greater trade opportunities offered by the improved transport links. 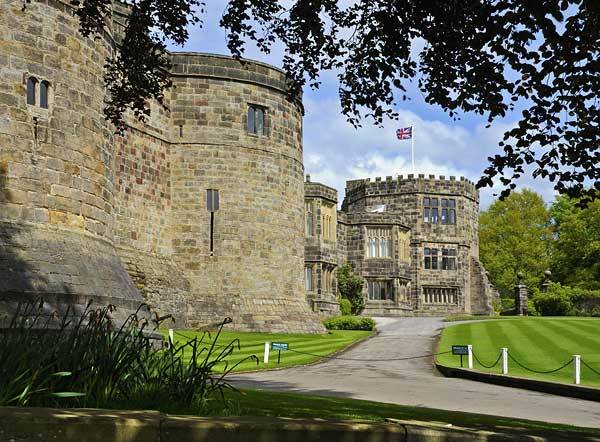 Skipton Castle is one of the most complete and well preserved medieval castles in England. 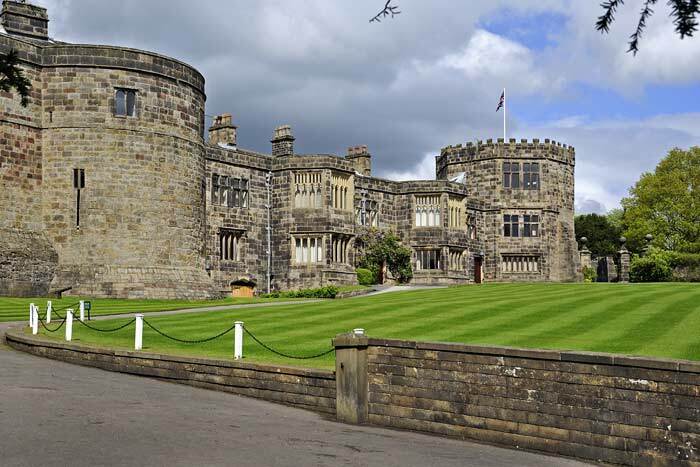 The history of the castle is inseparable from that of the Clifford family who were granted the property by Edward II in 1310, when Robert Clifford was appointed first Lord Clifford of Skipton. He began heavily fortifying the castle but was killed at the Battle of Bannockburn in 1314 with his new stronghold barely completed. Roger de Clifford inherited the castle. High above the battlements in Norman French the proud challenge of the Clifford family "Desormais" (Henceforth) is cut in stone facing both north and south. 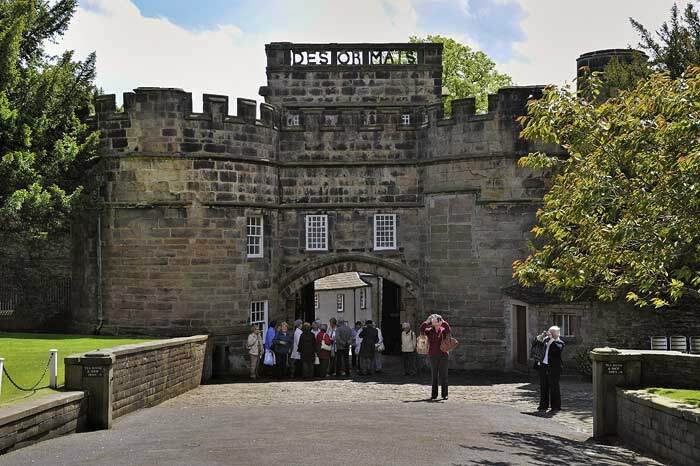 During the English Civil War it was the last Royalist bastion in the North, yielding only after a three-year siege in 1645. After the war the castle was skilfully restored by the redoubtable Lady Anne Clifford and remained the Clifford's principal seat until 1676. The Tudor Wing was added to the medieval castle in 1536 for King Henry VIII's niece Lady Eleanor Brandon. 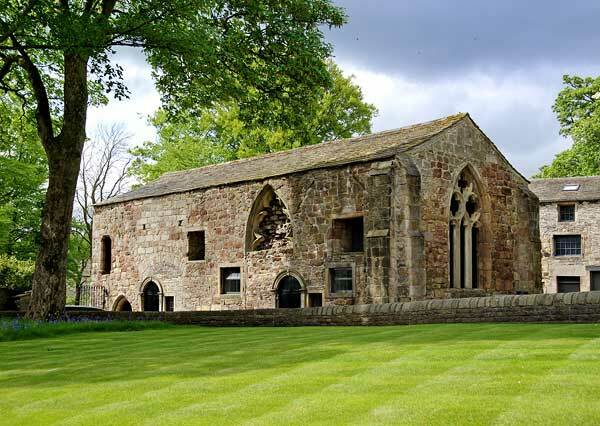 In the 1680s it was divided to make a private residence. Today it is the private residence of the Fattorini family. 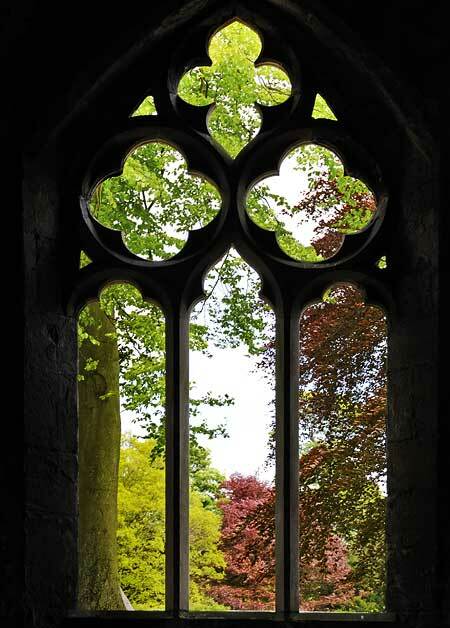 A view from one of the windows in the shell of the 700 year old Chapel of St John the Evangelist. The last recorded use of the Chapel was the marriage of Elizabeth Clifford to Lord Dungarvan in 1635, and two years later when her daughter Katherine was baptised. Chapel of St John the Evangelist. 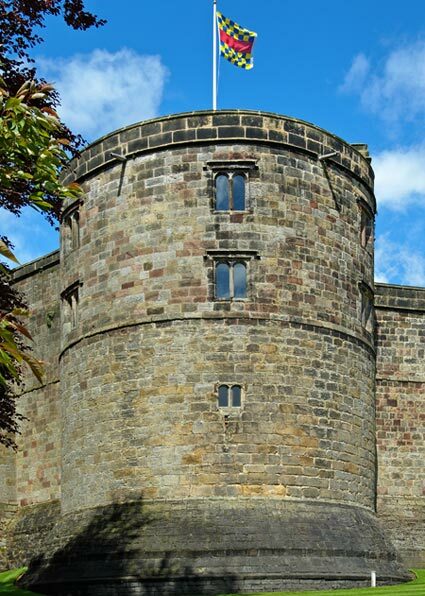 The building on the left is the Watch Tower which overlooks the main castle entrance. The heart of the castle consists of six towers and their interlocking rooms, and a great hall arranged around a small open court in the centre. the present Lord Clifford of Chudleigh who lives in Devon at Ugbrooke House. 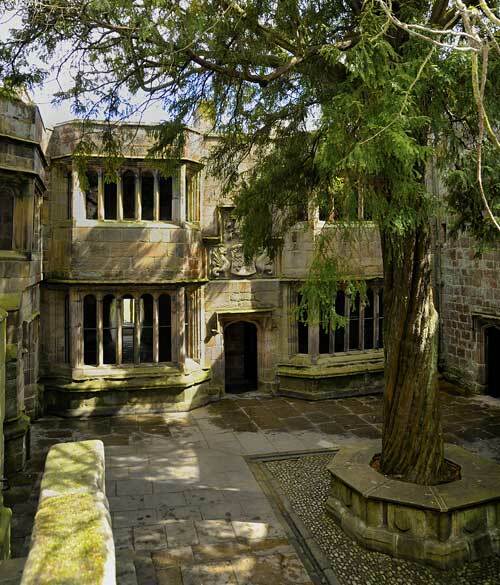 The Conduit Court was so named because it was the termination of the spring water supply piped to the Castle. The famous yew tree, now with a girth of over 9ft was planted as a sapling by Lady Anne Clifford in 1659 soon after her restoration of the Castle at the end of the Civil War. Looking up the kitchen chimney! 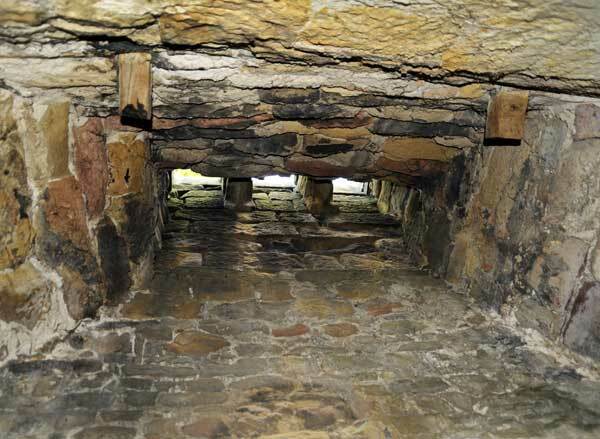 This chimney was in the original kitchen of the castle which was used until 1680. After that date a new kitchen was used until 1900. It's interesting that in 600 years the Castle only used two kitchens. 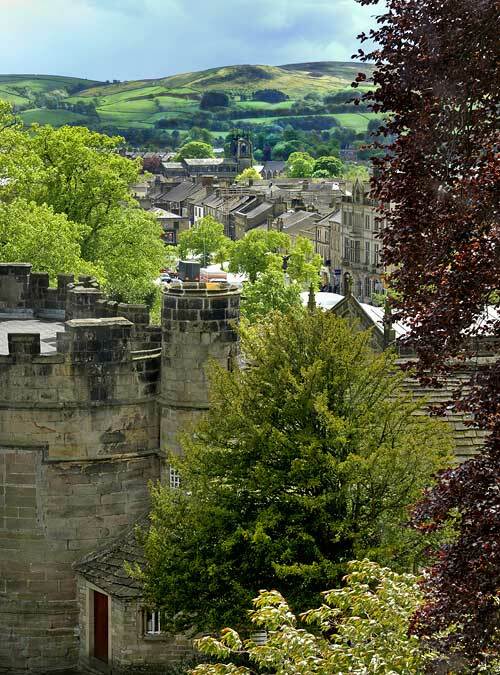 A view of the town and countryside beyond Skipton Castle - worth fighting for indeed. 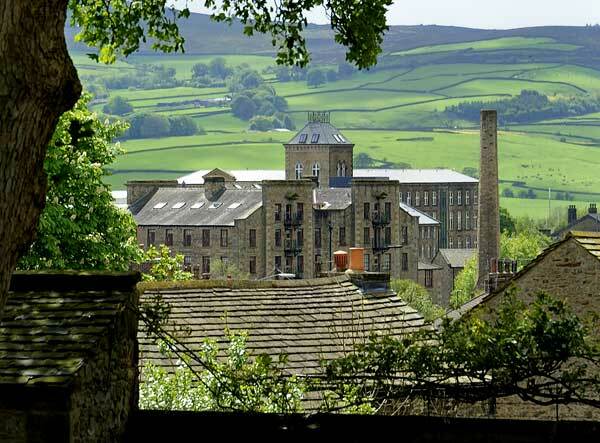 Built by John Dewhurst the Belle Vue Mills, (also known as Dewhurst Mill) were opened in 1828 as a spinning and weaving mill, but only lasted two years before burning down, they were immediately rebuilt, but this time as a cotton mill. In 1852 an extension was added to allow another 385 looms to be housed, with another extension added in 1870. By 1882 Dewhurst's had a floor area of 20,000 square yards spread over 5 storeys and employing over 800 workers. The mills did spinning, weaving, making of sewing cotton and dyeing. Today the buildings are a multi-complex of residential and office accommodation. 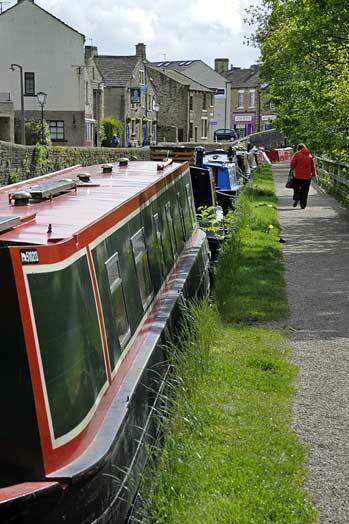 The Leeds Liverpool Canal passes through the centre of Skipton. The Canal took 46 years to build with the cost finally exceeding five times the original budget. 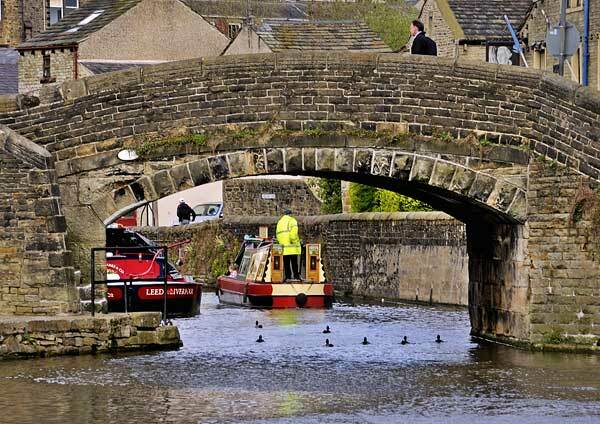 The first part to open was the lock-free section from Skipton to Bingley in 1773 and was busy all through the 19th century carrying stone, coal and many other goods. Above and below is the Spring's Branch (Lord Thanet's) Canal, this was a privately funded branch of the canal which gave access to a tramway from Lord Thanet's limestone quarries. In the background is the tower of Holy Trinity Church, and the new houses in Canal Street. 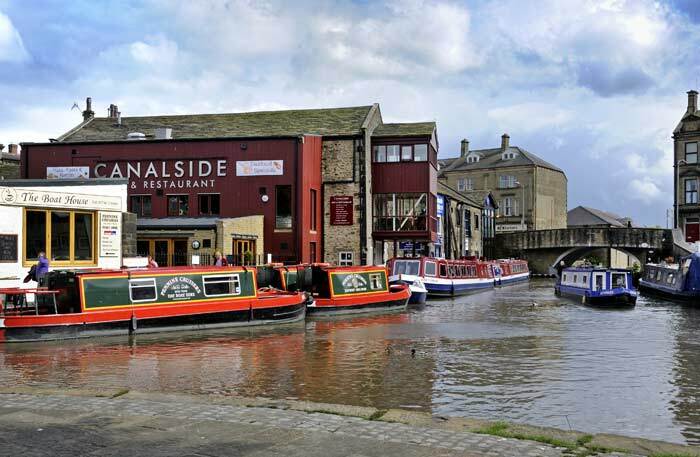 The Canal basin in the centre of Skipton. There are many buildings around the basin which were connected with the milling industry and the production of woollen cloth for export. Today, the wharves which would once have stored and loaded the fabric onto barges have been converted into shops and restaurants. 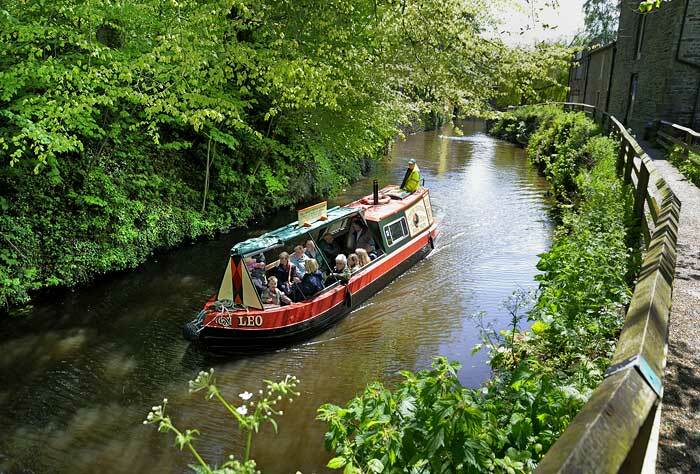 Disappearing out of the basin and onto the Spring's Branch which although only half a mile long is a beautiful stretch of canal that winds around the back of Skipton Castle acting as a moat, and until 1946 was used to transport limestone from a quarry higher up the hill.